James Corden defends Jimmy Fallon's notorious Trump interview, reveals how he would handle it. Jimmy Fallon's interview with Donald Trump during the campaign was the hair ruffle seen 'round the world. Fallon was slammed for going easy on a fascist, his cutesy treatment of Trump viewed as normalizing the madness. But in an interview, Fallon's fellow singing-and-hosting James, James Corden, defended the interview at a panel at PaleyFest. 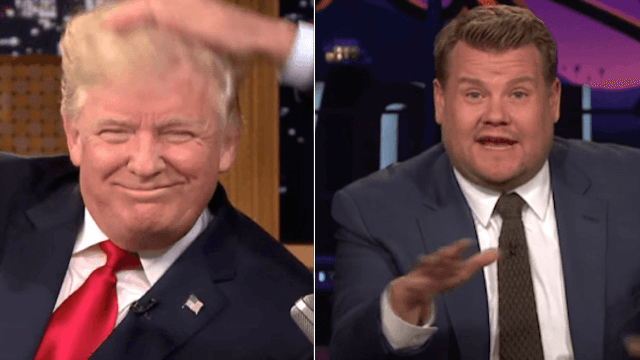 While Trump never visited The Late Late Show with James Corden during the campaign (though the Access Hollywood bus was his own special Carpool Karaoke), but Corden did have a plan for what they'd do with him. And it's harsher than hair ruffling. The game I wanted to play if he came on the show was called ‘Stand By It or Take It Back.’ I would read Donald Trump things that he had said on the campaign trail. I would say, [he’d] have two paddles, you can stand by it or take it back. If you take it back, you take it back forever. If you stand by it, you’ve got to tell me why, and I felt like that was such a good game. “When we take swings, you will absolutely know where we stand," he explained. For example, Corden's segment on his journey through LAX made a powerful statement about the Muslim Ban.